First complete publication ever! The sounds and intensity of Volume Five's folk music surpasses anything heard in their classical music. With Japan's ongoing modernization and loss of its traditional music, our audio restoration removes artifacts from chronological chains to resonate in the eternal flow of sound that defies time and space to remain vital and always in the present. Our serendipity began to unravel when seven-year-old Beate Sirota Gordon was taken from Vienna to live in Tokyo in 1929 after her concert-pianist father Leo Sirota’s smashing debut there created a fever for his playing. She soon become fluent in Japanese. Sirota taught Yoko Ono’s father,and eminent banker, and Sirota’s wife gave his daughter Yoko piano lessons until the war broke out. While studying dance at Mills College, Beate lost contact with her parents, not knowing of their fate. After Japan’s surrender, General MacArthur organized a force to occupy post-war Japan, choosing only non-Japanese speakers, including Beate. who was joined their team at age 22. Not long after docking, she found her parents were alive but in exile and in secret, Beate joined a committee to create Japan’s postwar constitution that MacArthur’s staff would draft and have rubber-stamped without question by the Japanese parliament. Aware that Japanese women would be better off dead when becoming divorced or widowed and unable to vote, Gordon prevailed against American objections and it became the first constitution ever to grant rights to women. Donald Ritchie, another staff member, Nipponophile, and later an authority on Japanese cinema, stumbled across five fragile sets of 10-inch 78rpm discs. Although there were spaces for sixty shellacs, one was missing. Gordon directed arts programming at Asia Society for several decades, annually scouring the continent for authentic musicians, artists, dancers, theater, architects. Their debuts would occurred at New York’s Asia Society audiences and universities. One day in the 1990s, she indicated some dusty albums laying low on her bookshelf. “Donald Ritchie gave me them a long time ago. 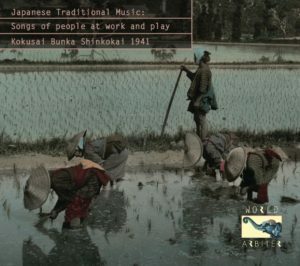 See if they’re of any interest to you.” Knowing traditional Japanese music, I was shocked by how their music sounded before Japan’s defeat: the sets compiled all the major genres of traditional music. Staring from the court’s origins in shamanic rites, Buddhist chant, Noh plays, it spanned into Kabuki, blind biwa players haunting songs of chilling epics, culminating in a final volume of folk songs captured rice planters, weavers, tuna and herring fishers, children, all with their own rhythms and the presence of an eternity in their every sound and breath, a feeling that was shattered along with their culture some five years after the discs were pressed. Track 3: Hôhai-bushi (Aomori); Tusgaru-yamauta. An on-line article discussing the pioneer gagaku recordings of 1903 led Arbiter to its author, Dr. Naoko Terauchi of Kobe University, who succeeded in identifying performers and translating the words. Gordon’s set turned out to have been one of two surviving copies: the other set also lacked the same disc! Intended as a non-commerical publication for libraries, they most likely were stored in a site that was bombed. Never one to give up, after over ten years of searching, Dr. Terauchi found a test pressing of the lost disc in a theater museum’s archive and through Dr. Terauchi’s tactful diplomacy access was granted so that way now a complete publication of the entire legacy that no one ever previously had access to. The sounds and intensity of Volume Five’s folk music surpasses anything heard in their classical music. With Japan’s ongoing modernization and loss of its traditional music, our audio restoration removes artifacts from chronological chains to resonate in the eternal flow of sound that defies time and space to remain vital and always in the present. Arbiter of Cultural Traditions | All notes and translations ©Allan Evans unless otherwise indicated.